The front of the Secret Lair peaks at 14′, which in addition to making for a mighty peculiar-looking structure in a 12×16 cabin can also make heating the thing in the morning a gradual matter. There were reasons for doing it, of course: It permitted a 6×12 sleeping loft, and also encourages venting through the loft windows during the hot months. But it’s a disadvantage in winter and shouldn’t be done for laughs. When I first wired the place I did rig a ceiling box and wall switch for a ceiling fan, as well as space over the Lair’s vestpocket bathroom for the blades. But I went quite a long time without one not so much because of cost but because the electrical system wasn’t initially up to running one even on sunny days. Providentially I inherited a big fan with a cracked housing from a neighbor who was scrapping it at roughly the same time I got my current scrounged but much expanded battery bank. So running the fan before sunrise is no longer a ridiculous thing to do, and the years-long problem of the Lair’s absurdly high ceiling is now largely compensated for. 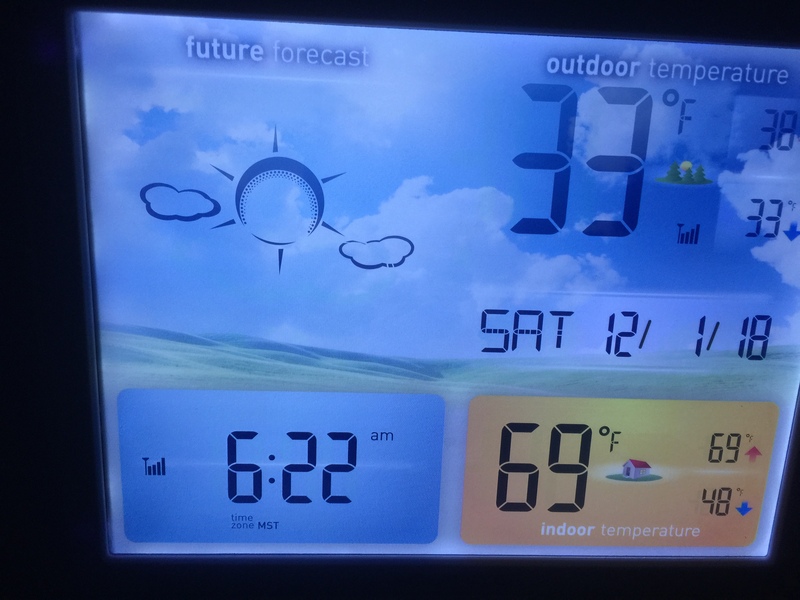 It was overcast all night so never got cold at all – but I was still able to bump up the indoor temperature 20o in an hour. That used to take much longer on the rare mornings I accomplished it at all. I tend to be scrooge-like about fuel, since at some subjective point it’s easier to just put on a sweater. As you only use your loft as storage these days, wouldn’t a trapdoor over your loft access keep the heat downstairs where you wanted it? I am thinking a piece of two inch thick foam insulation there would do the trick and is easy to shove aside when you need to go up there. In winter a cold loft might just provide convenient in house refrigeration for perishables and beer as well. The whole railing side of the loft is open as well. A false ceiling? Or a field fix tarp and paracord arrangement and triple wall stovepipe arrangement to trap initial hot air? Just for winter. Ah OK , somehow I had missed that image. Would it be difficult to create a ceiling and partition the loft off? Not impossible, but still probably more trouble than it’s worth. The ceiling tapers to eight feet on the south side, so even with all that height it’s not a huge amount of cubic footage.